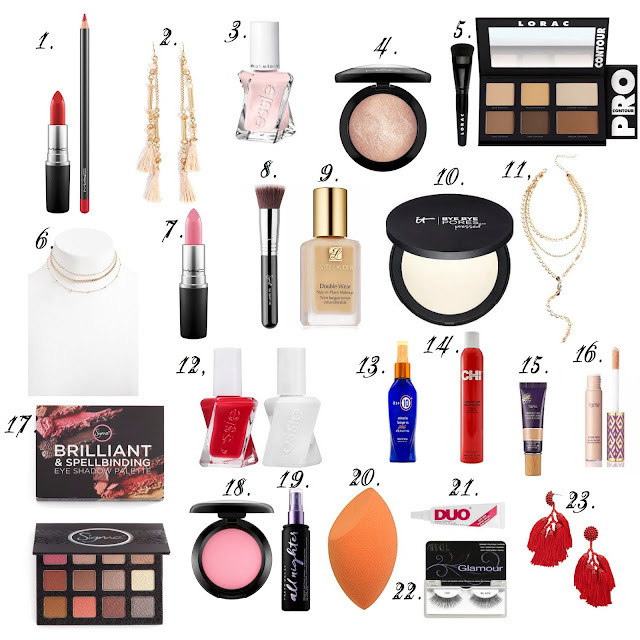 With Valentine's around the corner I thought I would share some of my favorite items to get you all glammed up for the big day. Some of these products I have been using for years and others I have been using a few months and just love! 1. MAC Lip & Lipliner Duo in shade "Cockney/Cherry"
3. Essie Gel Nail Polish: my go to shade! 9. Estee Lauder Double Wear Foundation: I've talked about this foundation before, but it is worth every penny! A little bit goes a long, so it will last you a while. 10. Bye Bye Pour Pressed Powder: I just started using this because I heard great reviews about it. If you have large pours, you will love this. It basically blurs out your pours. 11. Styled Collection Layered Necklace: This is a multi length layered necklace. 12. Essie Gel Nail Color & Top Coat: This gel nail polish is my go to when I don't have time to get my nails done. 13. It's a Ten Spray: Okay if there is one product you need for your hair other than shampoo and conditioner it is THIS! I started using this right after I had Hudson and this made my hair grow so fast! 14. CHI Hairspray: I only use this. 15. Tarte Creaseless Concealer: I have used many concealers and this one out does them all. It is thick and literally does not move. And the best part...IT REALLY DOES NOT CREASE! 16. Tate Shape Tape in shade "Fair" I just started using this as a highlighter and I am obsessed!!! 17. Sigma Eyeshadow Palette: I bought this back in November because I loved the neutrals colors but was a little nervous to try a new brand. But I have to say, I find myself using this palette more than I do my MAC eyeshadows. 18. MAC Blush in shade "Pink Swoon"
19. Urban Decay All Nighter: I honestly bought this just to see if it really would be an "all nighter". And it def lives up to its name. 20. Miracle Complexion Sponge: THIS IS LIFE CHANGING and you need it! 21. Eyelash Glue: I have used this for 10+ years. 22. Eyelashes: I use these every single day.